It was bound to happen. I’ve been running for over 10 years now without an injury (if you don’t count a sesamoid stress fracture), but on Tuesday night my luck “ran” out. 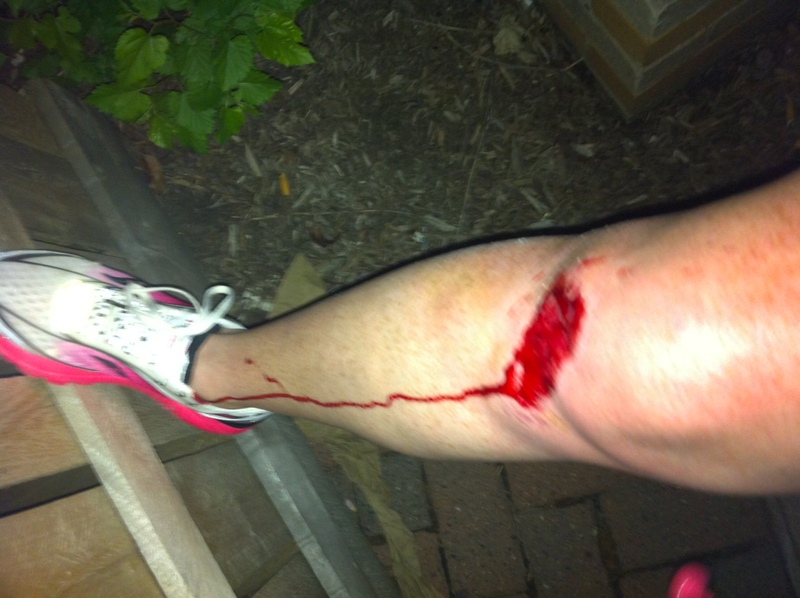 Miraculously, no broken bones or sprained joints…so I still think I came out ahead. I ended up walking the rest of the way home. My kids had fun playing doctor and I felt a ton better after getting cleaned up. I’m super sore and bruised, but my attempt at a power walk/jog this evening went well…so I’m still gearing up for the GW Parkway 10 Miler. I also want to add a quick bit of praise for our amazing Office of Attending Physician nurses, too. These incredible folks provide medical care to hundreds of tourists visiting the Capitol Complex each year. At work today I hobbled into the first aid station for an extra band-aid and the nurses bandaged me up like a pro volleyball player. Awesome! Oh no Kate, that looks painful! I am glad you are okay! Seeing as how those knees got infected, I would sue your children for malpractice…. Their little pockets aren’t deep enough! 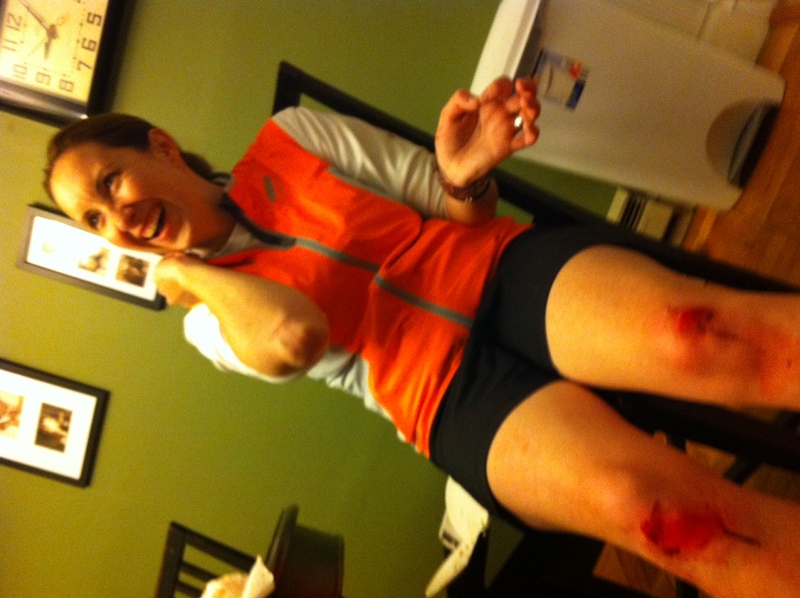 I did the same thing before – went right off a curb flat on my face, and banged up me knee. 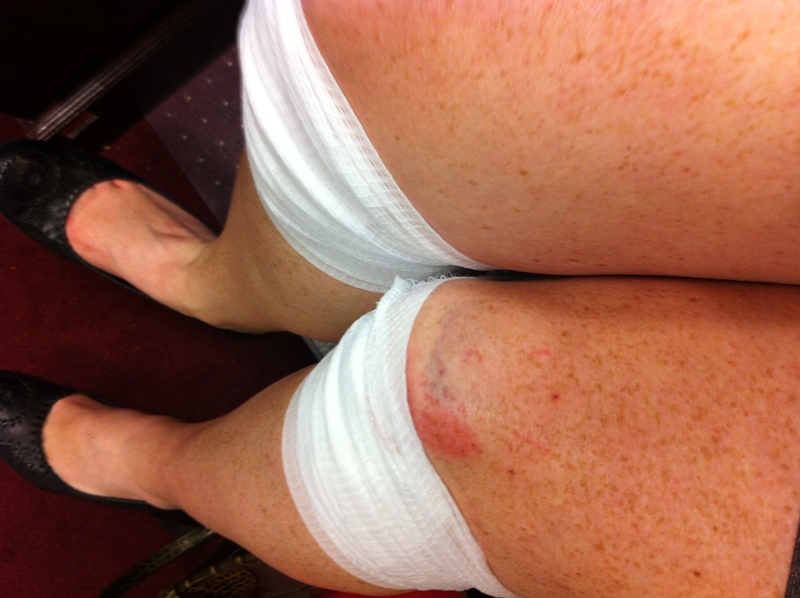 At least with a wound you easily can tell when your knee is better — no second-guessing like with a sprain. Exactly right! I took a week off, just to be sure. Ran last night and felt good. Looking forward to the GW 10 miler!